And with it a whole new pile of resolutions, plans, good intentions, desires, aims and ambitions. Things to take up, things to give up, new things to learn, old habits to lose, etc. I know that as ever, most of them won’t actually materialise in the way I’d like, but it’s good to have something to aim for (or at), isn’t it? I can’t even begin to explain how much this has helped me over the past year. I don’t think I would have been half as efficient without it. I now have two jobs, plus the creative side. I have my mother living with me, a partner, three cats and a large house to maintain in some sort of order. Keeping the journal for 2017 (although I didn’t start it until about May) has meant that I have never turned up at the wrong job (or the right job on the wrong day), never missed an appointment, never – well only once – failed to be home when a planned visitor arrived, and have managed to keep a much better eye on my finances (although they are still pitiful by most people’s standards), at least now I know exactly where I stand at all times. This is an ongoing thing with me, there is always stuff I NEED to know how to do. I’ve already started this year by learning how to loom knit – it’s so quick and easy and you can turn out really nice things. I can see this being an ongoing learning curve itself. Traditional knitting is just not my thing – I can’t do it, never get the row counting right, and always end up with a triangle as my knitting always, always grows. Long live the loom! The other part of being nice is being more honest, but in a more gentle way. This is going to take a lot of work. A. lot. Of. Work. That’s a loose definition for me. I include in it the dolls, the jewellery, the little paintings, anything that grabs my attention and forces me to think hard and problem-solve and produce something interesting or attractive. I do this for my own sanity, and I know that this year, in spite of working more, I’m going to need more time for this because without it I can’t really see the point in any of the rest. So that’s it. My great plan to conquer 2018. It’s is in fact, very similar to my great plan to conquer 2017, and the one for 2016, and nearly all the years before that. I’ve never felt at the end of the year that I did my best all the way through it. I always resolve to try harder. And I always fail. But I’m human. I try. And I can live with that. It’s up there with the most horrible feelings I have had the misfortune to experience. More horrible than the car crashes I’ve been in (three to date, and no, I wasn’t the driver in any of them), and almost more horrible than the frozen shoulder pain, which was excruciating and made me scream out loud every time I forgot about it and tried to lift my hand above hip height. Go on, try and keep one hand down by your side for an hour, yet continue to go about your life normally. Not possible. The thing I’m trying to describe, admittedly somewhat clumsily, is the bite that I took out of the pavement just over a week ago. I don’t remember clearly tripping or falling (although one look at the state of the pavement and you can see exactly why it happened). I do however remember with painful clarity the slow motion crunching and snapping as my teeth connected with the concrete. I’m not particularly vain – like most of us, I didn’t appreciate the inherent beauty of youth when I had it. Now that it has flown I’ve kind of settled into my looks. I’m comfortable with them – or I was until last week – and I complete the daily rituals at Aphrodite’s altar (my dressing table) as a matter of habit as much as anything else. But there’s nothing quite like a smack in the face from a lump of concrete to make you realise that for years you have failed to acknowledge your good fortune in being even passably attractive. The pain of course is the worst thing, but it is compounded by the sudden realisation that you do not look like yourself. A black eye, cuts and grazes, bruised forehead, and those broken teeth. I looked like the victim of a far worse accident than the one I had suffered. At the time I also feared that I had broken my arm (it’s still painful, not broken but ligament damage) and I had very badly bruised my knee – if you can call the area from four inches above your knee to five inches below it, all knee. The shock was a factor I haven’t had to consider before either. The rubberiness that we have before middle age disappears quite swiftly once you hit 50 – take my word for it. When you fall, you really do fall. No time to catch yourself, no time to think – just CRUNCH – or SPLAT – depending on what you land on. Shock makes you shake and fail to form proper sentences. I’m so grateful to the lovely ladies (both considerably older than me) who helped me up and called the friend I was on my way to meet, and gathered together the contents of my enormous handbag, which had spread themselves over a wide area as soon as they were given the opportunity to escape. Also to my fabulous friend Paula, who appeared like a genie, dragged me into a bar and held ice over my eyes thereby heading off a lot of the more visible damage. She also arranged for her lovely husband to come and drive me to the hospital for x-rays and other exciting procedures. And for my lovely partner to come and keep an eye on me. The moral of the story is: be grateful for good friends. We are so very lucky with ours. Also, wear sensible shoes and keep an eye on wonky pavements. Some people are nuts about teddy bears, and soft toys in general. Show them a cute looking stuffie and they’re like normal people are when they see fireworks, all ‘Oooooh’ and ‘Ahhhh’ and quickly licking their fingers clean before reaching out for a squeeze of said unfortunate bear/ squirrel/ elephant/Catherine wheel. I’m not one of those people. I like dolls and puppets and I like making them, but I like them to be a bit odd looking. I feel the same about people. Symmetry and cuteness doesn’t usually do it for me, I like a bit of character. I like the eyes to be odd, or the smile to be lopsided. Perfection puts me off a bit for some reason. It’s as though something that perfect on the outside must be covering up something less pristine on the inside. Very unfair of me, I’m sure, but that’s how it is. So when Ma bought a book on how to make bears (on a whim, we were actually looking for a book on how to knit hats for cats), I didn’t give it much consideration. If she wanted to make a bear, let her. 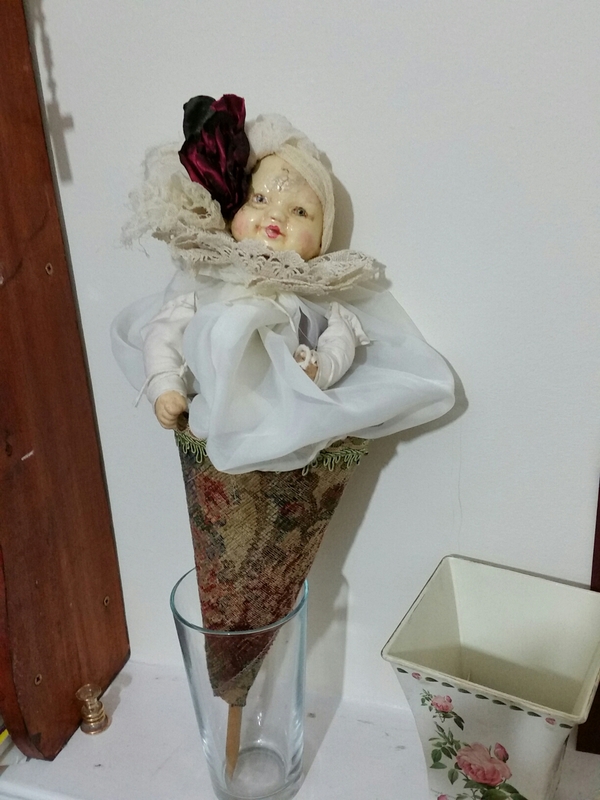 I spend a lot of time in my studio on the dolls, so it seemed good that she would have something interesting to do. A few days later, with the world obscured by rain, we thought we might have a go at one. I was joining in just to be helpful and get things started, as it’s been a long time since she did any sewing. We didn’t have any fluffy fabric, so we used some pink spotted cotton and diligently made templates and cut out the pieces. I had never made a bear before (or should that be ‘behind’? Let’s settle for ‘previously’.) Naively, I thought I could trust the book. Now, I would like to show you a picture of what happened, when all the pieces were cut out, carefully stitched together and the whole thing stuffed (no stuffing had been bought either, so we used the contents of a cushion). But I’m afraid it would hurt your eyes, and you may never be able to ‘unsee’ it. Suffice to say that it looked way more piggy than bearish and that was not only due to the pinkness of the fabric. We both felt quite disappointed and, to be fair, a little cheated. So we had some wine and put the pinkbearpig out of sight. The next day, undaunted, we decided to pop out and pick up some proper bear fabric and have another go. This bear came out looking much be(ar)tter – but to me it wasn’t a ‘proper’ bear. It didn’t have moveable limbs and head, and was made with a minimum number of pattern pieces. It was good, but not very satisfying. Day three saw us making another bear from the book, with the required moving limbs and head, in the proper fluffy fabric, and with great determination and hope. And this is when I learned not to trust the patterns you get from books. Although the head was good, the body was too small, the arms were far too fat and too short, and the legs were impossibly stumpy. Also the ears were not in proportion and seemed to be set in an odd place. I have never seen such a deformed creature (except for the pinkbearpig, obviously). Depression set in, swiftly followed by some wine, while we regrouped and considered our options. At this point I had a quick Facebook chat with a friend who has been successfully making bears for years. He reassured me that every bearmaker has a few monsters in the basement where things did not go quite to plan. He also pointed out that bearmaking is addictive and I should be careful. Bear number four happened a few days later. This time I decided to trust no one, and made so many alterations to the original pattern that it no longer ‘bears’ any resemblance to the one in the book. And guess what? I MADE A BEAR! Not a monster, not a pinkbearpig, but a real proper bear! I quickly handed it over to Ma for a dressing session, and the result will be posted separately. The following day we made another one, different fabric this time, and female, as a companion to the original. Christopher was right, it is insanely addictive, especially when you design your own instead of relying on someone else’s pattern. I already have a studio lined with dolls, and fully expect to have a living room full of bears by the end of January. And probably no cushions left. In the ‘new’ 200 year old house there are four floors, three people, and three cats. Whilst all of the humans (and one of the cats) are happy to eat together in the kitchen, the other two cats have segregated themselves according to floor. We therefore have one cat for each level, although the ground floor cat (Sossage) includes the basement in her territory. As they had sorted themselves out so neatly, we put a feeding station and a litter tray on each floor for each cat. They all (except Sossage, who will eat anything) have their preferred foods, and their acquired habits, and seemed quite happy with this arrangement. Poppy and Sandy are also quite elderly, and don’t seem to desire too much in the way of excitement, so when Sandy started to occasionally creep down to visit Poppy’s floor, they kept a respectful distance, edged around each other on tippytoes, and each generally tried to pretend that the other cat was not actually visible. It was all very courtly and reserved, like a ballroom scene from Pride and Prejudice. And we, (the humans), were completely deceived by it. It wasn’t long before Sossage decided to venture up a floor – also to Poppy’s territory, but Sossage, bless her, is somewhat lacking in the finer feline social graces. Sossage greets everyone who is not a human, with an open mouthed and very sweary hiss. Anything new, anything moving, anything she thinks is in the wrong place – it all gets the same treatment. She has in this way shown her distain for everything from the curtains and the stairs to a packet of croissants, with particular venom reserved for the hat stand. In all other respects she is the most gentle and affectionate of creatures. She is very small and spent her first couple of months with us being carried everywhere in a sling around my neck, or in the pocket of my apron. She adores people and loves to be cuddled, and she is loved in return. She has a few issues though – apart from the indiscriminate hissing. She will not look anyone, or anything, in the eye. She is totally convinced that she is in fact just a slightly undersized lion, not a 10 inch long kitty. Her mathematics is truly dreadful, she simply cannot calculate the proper distance for a jump, or how to get on to a chair without banging her head on the arm rests, so she is constantly crashing into things and lacks grace. She also seems to have some gender issues, she often tries to spray things, and her face is wide, like a tomcat’s face. So the two upstairs old ladies, Sandy and Poppy, had a bit of shock when Sossage started to invade their peaceful world. Picture your mother and aunt, having afternoon tea in an elegant hotel, and being joined at their table by the town drunk. How would they behave? Would they pour him a cup and hand him a cream slice? Would they get up and move to another table? Would they just sit there in stunned silence and then collapse in giggles? Sandy and Poppy, wellbred females that they are, decided to ignore her. Or at least to ignore her as far as possible – Sossage does not always make ignoring her a viable option. Both Sandy and Poppy seem to sense that all is not quite right with Sossage, they are both experienced in seeing off other cats. Sandy in particular has a paw swipe that is so fast it can hardly be seen. This, combined with the huge feet and claws of a Norwegian Forest cat, and the fact that she has never been known to hold her temper when annoyed (we all have the scars to prove it, and I have a particularly lovely long scratch all the way across my face at present) means that her reluctance to just thump Sossage at every hiss comes as a bit of a surprise to all of us. But no, they both, apparently by tacit agreement, ignore her with a determination that has to be seen to be believed. Did I mention that Sossage is not happy about being ignored? I may have done. Anyway, she decided to start a war. Anything to get attention. She may have limited weapons at her disposal, due to her somewhat limited intellect, but she is definitely capable of creative thought. The three humans (remember them?) were having supper in the kitchen when Sossage came hurtling around the corner of the hallway, fell down the step into the kitchen, and ran to the far end, where she sat panting, eyes fixed on the doorway, tongue sticking out. None of us had ever seen her move so fast before, or be quite so agitated, and as there is no carpet in the hallway the skidding around corners had been impossible to miss – like something out of a cartoon. We knew she hadn’t come from the basement (lots of stairs and no room for skidding), so mum decided to go and have a look to see if one of the other cats had chased her. Unlikely, but worth checking. What mum discovered was that Sossage had started a guerrilla war. Her (clearly planned) opening salvo was to sneak upstairs to Poppy’s floor, and poop in Poppy’s litter tray. We know it was Sossage because (without wanting to bore you with too much detail), Poppy can’t bury hers and Sossage buries every offering as if it was treasure that she was planning to come back for later. Mum removed the offending item from the tray and we all had a good laugh about it. We didn’t think Poppy had noticed it. A couple of days later, I was working in my studio when I heard some scraping in the litter tray at the back. I turned round, expecting to see Sossage, but no, Poppy was getting her own sweet revenge. Poppy pees like a horse, and she had obviously been saving up her liquids for some time in order to bestow a special baptism upon Sossage’s tray. She looked mildly embarrassed to be caught in the act, but stared right back at me with a scornful expression as I took a photo (for evidence, I knew Mum would never believe her cat capable of such a thing). Another few days go by and Mum witnesses Sandy sneaking out of the upstairs bathroom, looking decidedly furtive. Another check of Poppy’s litter tray and yes – Sandy has left a little souvenir in Poppy’s litter box. At least she had the grace to look slightly ashamed of it. Two more days, and Poppy is back in Sossage’s litter tray, having snuck down the stairs and been as discreet as she possibly could, but everyone can hear her peeing, it’s like a tap being turned on behind you! So, at present the only unviolated litter tray is Sandy’s, and we think that is only because the other two haven’t found it yet. It can only be a matter of time. I shall keep you posted. It’s very hard to write anything, and I don’t really know where to start. I am just one of millions of people who felt they lost their oldest and most understanding friend on Sunday 10 January 2016. I first saw David Bowie when he sang Starman on Top of the Pops in 1972. I was 11 and was so entranced by him I just couldn’t get close enough to the screen. He made me feel things in a combination that no other person or situation has ever achieved. An incredible mix of admiration and desire, and an overwhelming need to analyse and understand what he was singing about – surely if he had written it, it must be hugely important? Such a hypnotic presence, and that smile! And then he threw a casual arm around Mick Ronson’s neck and I was his for ever. I think I’m just trying to explain why I feel this loss as such an immensely personal one – I really don’t know who I would have been had I not, together with so many others, been pulled into his orbit and had the opportunity to collect those sparkling gems of information with which his work was littered. Someone died, someone I never even met, and yet my whole identity is shaken simply by knowing that this person and I are no longer sharing a planet. In our continuing series of domestic irritations (see Fire, redundancy and broken bones), the next stage turnout out to be giving notice to quit our flat in August this year. To be fair, it was not strictly notice to quit, rather a notice that the building was being sold from under us and as soon as a purchaser was found, we would likely have to move out. Obviously, we didn’t want to hang around waiting to be given the old heave-ho, which could happen just before Christmas and I didn’t fancy spending the festive season worrying myself silly about where we would live, so we started looking for alternative accommodation right away. Not to labour the point about our trials and tribulations, but three days after the ‘notice of notice to quit’ arrived, my mother was hit by a car. She was on foot at the time, having parked at the supermarket and was en route to collect a trolley. Some meandering twonk managed to drive right into her from behind, breaking her wrist so badly it had to be wired together, and breaking her foot only slightly less badly. So much for this being a better year than 2014. The result of cumulative disasters is that they sometimes wrong-foot you (sorry Mum) so much that you are pushed into an entirely new position. In our case the ‘having to move’ coming relatively quickly after the closure of our gallery and the subsequent forced absorption of pictures and gallery furniture into a relatively small flat, together with worries about how mum could reasonably be expected to manage after what will undoubtedly be a long period of hospitalisation and recuperation, and of course, the fact that we are all paying the same bills monthly out for different living spaces, lead to the blossoming of a whole new plan – we would all live together. It was in fact a relatively slow bloom – I had been thinking for quite a while about whether it would be practical to have her live with us and whether or not she would like it. Turns out she had been thinking that her current home is not ideal in terms of accessibility and she had been investigating other possible options. The Artist, in fact, was completely unfazed at the prospect, as long as we each had enough space to escape each other. This turned out to be a crucial requirement for each of us. Mum wanted a place with a bedroom and her own living room, but didn’t mind sharing everything else. I wanted a studio space, and the Artist obviously wouldn’t be himself without an etching studio (although neither of us had an issue with continuing to share a bedroom. Phew!) So, wanted: a six room, preferably two bathroom home, with a large kitchen, and ideally some outdoor space. The Artist for reasons based around his work, wanted to stay by the South Coast. I love it here too. Mum had always wanted to live by the sea, so wasn’t averse to coming in this direction to live and giving up the amenities afforded by Surrey. House number three of the places we looked at turned out to be The One. Well, at least the Artist decided instantly that it was The One. If left to mum and me we would probably have passed it over on the grounds of needing too much basic cleaning, let alone anything else, but you can get swept away by someone else’s boundless enthusiasm, especially when it is someone you love. The particulars of the house didn’t show up on any of the local searches we did, and none of the local agents we had listed with sent them to us. Instead, they were forwarded to us by the wonderful woman who inspired Trippet Castle Dolls – the Lady of Trippet Castle – who was living in London but managed to find the perfect place for us on the interweb thingy. The house is old. Old, dusty, slightly damp and absolutely chock full of character. It has the requisite six rooms (most of them with wash hand basins in), plus large kitchen and one bathroom plus one extra loo. No outside space, but hey, it overlooks the beach (SEA VIEW!! ), so we can treat that as our garden, can’t we? As far as we can tell it was built between 1800 and 1825. It has been lived in by someone who was five times Mayor of our town, and also by Napoleon III just before he launched an attempted coup in France (but due to bad planning managed to get captured with his small army on the beach as soon as they landed). It has tall ceilings, arched doorways, picture rails, dado rails, nooks and crannies and storage cupboards that are big enough to walk into. It has a basement. And the basement has a basement too. I have only lived in it for two weeks, and that only on and off, and so far the kitchen has flooded twice, the lever has come off the downstairs loo, the upstairs bedroom is vast and very chilly, the roof leaked, and the cat is freaked simply by the size of the place in comparison to the flat, and keeps getting lost and then sitting down and howling until someone comes and finds her. The front of the house is like a greenhouse (big windows, south facing) and the back is like a fridge. The alley from the back of the house past the other buildings is like something out of a Dickens novel – but with some extra disused fridges and televisions thrown in for good measure. We understand it will take a while to learn the house. To learn how to make it breathe properly so that the ‘old house’ smell disappears. To learn how to locate each other inside it. To learn which wash hand basins have the left tap as the hot one, and which have the right. To learn the light switches (a) where they are – not as easy as you would think; and (b) what lights they operate – also not always obvious. We have to paint out the dark colours, and clean it completely, replace the taps, the bath, the broken window catches, unstick the windows that won’t open and fix the sashes on the ones that won’t stay closed. Learn how to clean and restore a marble fireplace. Put doors (or at least curtains) on the cupboards that don’t have them. Make blinds, find suitable furniture, get on better terms with the vacuum cleaner. The list is endless. Wish us luck in our new home. I think it’s about time we had some. shocked to discover what is going on in Rara’s life – she is one of the kindest people I have ever known. and a great example to follow. I love this post, and hope it makes you think just once or twice a week about how we could be nicer to each other. I haven’t posted for ages, so it seems. But if it’s any comfort, it’s not just that I haven’t posted here, I haven’t done much on Facebook except for repost other people’s pictures, and I have hardly seen any friends or relations except for one wonderful evening out – more about that later. In fact, it’s probably just a couple of months since my last post which was about the fire and my broken foot. Sadly, this post is probably not going to be any more chirpy. During the course of investigating the mysteriously broken bone, osteoporosis was flagged up and in the course of investigating that, Graves’ Disease (a form of hyperthyroidism) was diagnosed. All in all, it’s been a busy few weeks, with me averaging hospital trips at two a week. I still have the velcro boot, although I am now allowed to take it off when inside and on a flat surface (but as I live in a very old building none of the surfaces are actually all that flat). Graves Disease is another thing altogether. I have been feeling like death warmed up for the last six to eight months, but trying to carry on regardless. In all honesty, I put most of the symptoms down to the menopause (headaches, tiredness, bad memory, muscle pain, inability to sleep, emotional see-sawing, etc). To have a diagnosis is both a relief and a further worry at the same time. Now that I know why I feel like crap I almost don’t mind. However, the problems associated with Graves’ are so unpleasant in themselves (and specifically affect the only two things I have ever been squeamish about – eyes and nails), that I am having difficulty adjusting to the idea. I also have large amounts of medication which although it is no doubt doing its’ job trying to stabilize the chemical imbalance my body is going through, it is going to take weeks to get the dosage right and to make me feel better. For the last few days I have been barely able to summon up the energy to stand, let alone do anything useful. I’m compensating by making plans in my head, but that is really not much good when your memory is behaving like a colander – the plans or designs I make in the morning have gone by the evening. Notes help, but my hands are shaking. Today, however, I feel a little bit better. Fewer scary dreams last night (a by-product of the drugs), and I have actually started work on a quilt, so the day doesn’t seem such a waste. Plus, writing and posting this will make me feel like I’ve ticked another thing off my list. 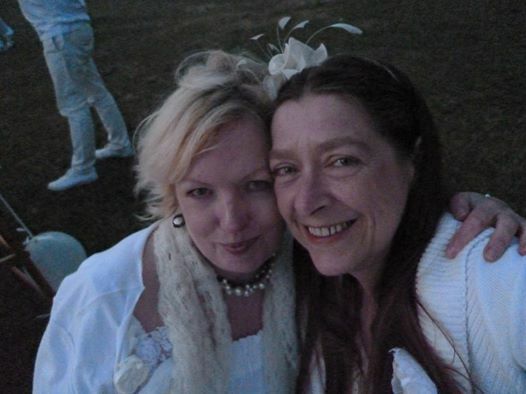 Earlier I mentioned the one evening out with friends – it was Hastings very first Diner en Blanc – we had a communal picnic in the local park. We all brought our own food, tables, chairs, candles, and wine, and we all dressed in white. It made for a beautiful summer’s evening and a very memorable one! and this is me and my American friend, Lily. May 2014 has not been a good month. 1. I am under threat of redundancy – initially they got it wrong and told me I was redundant, before rescinding it – for now! 2. I have broken my foot. In fact, it has been hurting me on and off for ages but got very painful and swollen at the beginning of May so I gave in and went to A&E where they told me it was broken – and has been for some time. I now have a very attractive velcro boot to hold it all in place and am not allowed to put weight on it. And did I mention the pain? 3. Big fire in the Old Town which at one point apparently threatened to engulf the whole town. Six neighbours are now homeless, one jumped from two floors up in a burning building and has serious injuries as a result. Several businesses have been closed because the damage is too extensive for the buildings to be safe to use – and yes, of course one of those is the gallery where The Painter is currently showing his work. We are coming to the conclusion that the gods hate us. Just in case you thought I was making it up!